Kingspan Solar Panels – Quality solar panels manufactured in Ireland. As part of our extensive product range we offer Kingspan Solar Panels for those interested in a great product that is Irish manufactured and covered with a great warranty. The range includes Kingspan solar evacuated tubes and flat plate kingspan solar panels. These highly efficient solar panels are extremely popular and are Irish built in the Kingspan Solar Renewables factory in Portadown. Kingspan solar panels are fully certified by the NSAI and ideal for both new build houses and retrofits on existing houses. 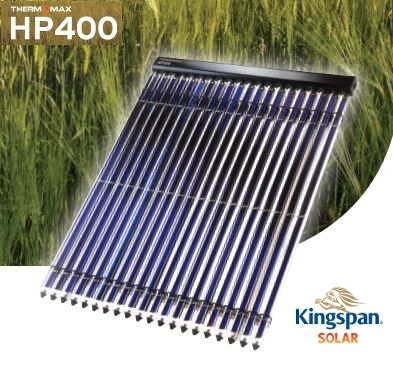 Please see our Kingspan HP400 Tube solar panel prices here. If you are interested in getting a turnkey installation service please give us a call and we can arrange this through our nationwide network of trained renewable energy installers. We will be happy to arrange a free consultation to discuss how you can get Kingspan solar panels in your home. Drop us a line here or Call Simon on 01 6262333. We like to make installing solar panels as easy as possible so please contact us to arrange a site visit by one of our installation partners. In the meantime below are some things to consider when thinking about your installation. 1. There is access to a South facing roof (anything between South East and South West is fine) with room to install the panels. 2. You have attic space with reasonable access. 3. The distance between the hot water cylinder and the roof is less than 15 metres. The site survey is necessary to find out the technical aspects of installing any renewable energy source into your home only and to inform you of the process involved. If you agree, the installer should contact you later with a no obligation quotation based on the prices above. If your house has some aspects that will extend the solar panels installation process there may be an increase in the prices quoted above. Our installation partners will make sure everything is ok by arranging a visit to your household to discuss your requirements and guarantee that the price quoted to you is the final price. Be aware – there should never be a requirement to sign up to an installation at the time of the site visit. Some companies use a selling technique that involves pressurizing you into signing up and giving payment details there and then. This should be avoided. Please contact us to arrange a site visit and to see if your property is suitable for a Kingspan Solar panel installation.